First published on Nov. 16, 2016 and last updated on Mar. 21, 2019. For solidbody electric guitars, the $200 to $500 price range is where things start to get serious - quality is good enough for mid to advanced level players, while the price remains beginner friendly. Here we present you with the best performers in this price segment, based on the most recent reviews and ratings data up to March of 2019. Our aim is to help you narrow down the options to only the ones that are worth looking into, so you can confidently get a guitar that suits your preferences. Below are the top rated guitars arranged according to their pickup type. We've also included general information regarding the companies that built them, professional guitarists that have played them, and summaries of how the market feels about the instruments. 97 out of 100. Incorporating 850+ ratings and reviews. 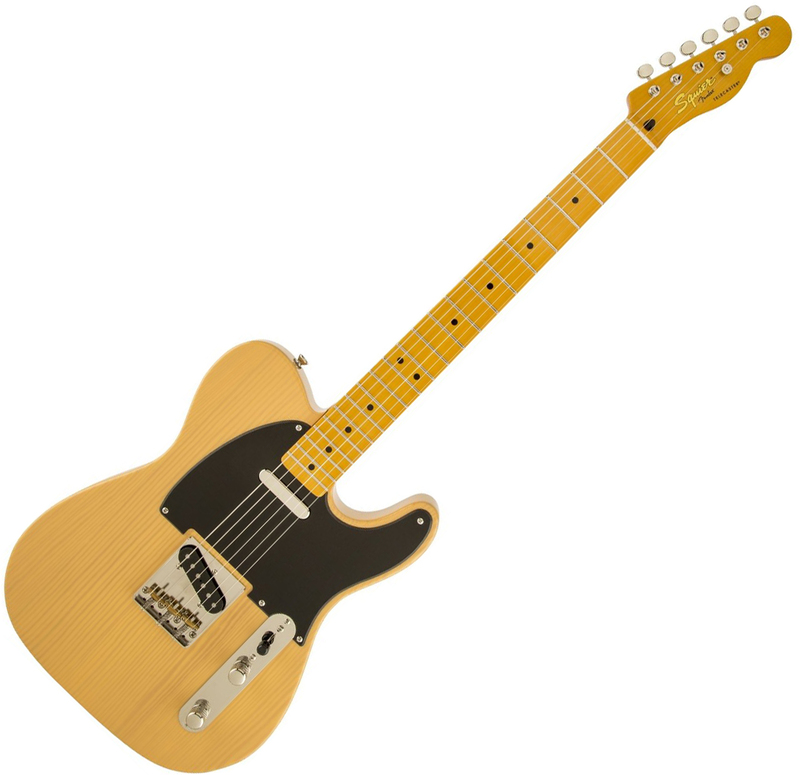 The Fender Broadcaster, later renamed to Telecaster, is considered as the first commercially successful solidbody guitar - and now, more than half a century later, the Telecaster is as in-demand as ever. The Squier Classic Vibe Telecaster '50s continues this legacy with its combination of vintage features and modern reliability. Features of this guitar follow vintage designs closely, including its single-cutaway body, the specs of its maple neck, and it comes equipped with a set of vintage sounding Alnico III magnet pickups. To keep the price affordable and improve playability, Fender utilized lightweight pine wood for the body and went for a modern C neck profile, and a flatter 9.5" fingerboard radius over the 7.2" that's seen on vintage specimens. Review pages are filled with positive comments from guitarists who were impressed by how this affordable guitar successfully captured the classic vintage vibe of old instruments. Even experienced players with actual vintage Telecasters were appeased enough to take their time to write detailed reviews and recommendations. Many users were happy with its lighter pinewood body, thinner neck, vintage appointments and twangy tones. And it is clear that this is not your average practice guitar because a good number of reviewers reported using the Squier Classic Vibe Telecaster '50s in actual gigs and recordings. There are a few who mentioned minor imperfections on the finish and fretwork. There are also those who reported having to make minor adjustments to the guitar's setup out-of-the-box, but most of them still rated the guitar very high. A few experienced players mentioned that swapping out the bridge pickup greatly improved the tone and enjoyment they get from this guitar. If you're in the market for a reasonably priced Telecaster, then the Squier Classic Vibe Telecaster '50s should definitely be the first model for you to seriously consider. 97 out of 100. Incorporating 400+ ratings and reviews. Wielded by the virtuosos lik Jimi Hendrix, Stevie Ray Vaughan, John Mayer, Eric Johnson and many more, the Stratocaster is undeniably one of the most instantly recognizable guitars in the world today. This is further established with its evidenced by the number of versions available, along with the many ways other manufacturers have copied and modified the design for themselves. Speaking of copying, you will notice that a number of guitars in this list follow the Strat's double-cutaway shape, a testament to its legacy and continued popularity. If not for us limiting the list, we would've ended up with more Squier Stratocaster variations in this guide, because many of them are highly rated. Among these highly rated licensed Strats, the Squier Classic Vibe '50s got the highest ratings, so it is only fitting to give it a prominent spot in this list. 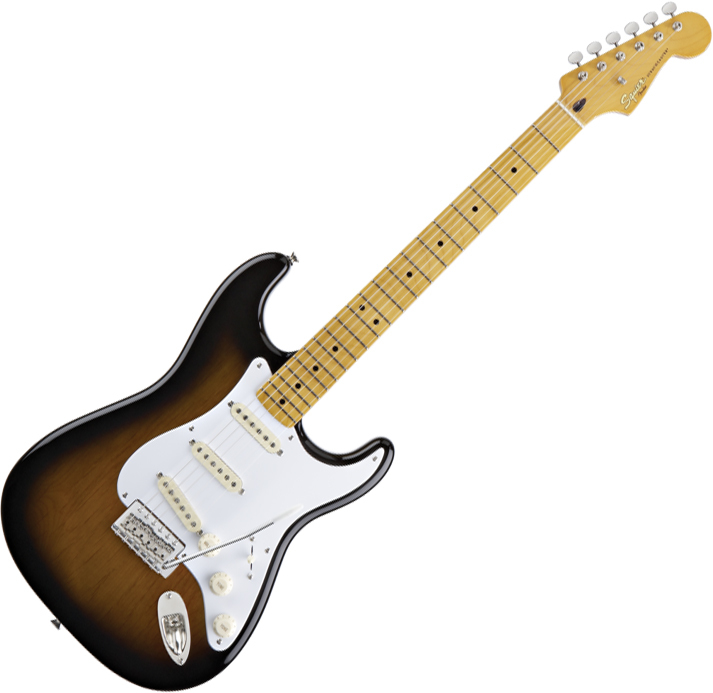 This model follows after old Stratocasters from the '50s, featuring an alder body with a maple neck, as well as familiar specs that include a 25.5" scale length, 1.65" nut width and "C" shape profile. To cater to today's players, the fingerboard radius is adjusted to meet modern standards at 9.5". Finally, three single coil pickups give the guitar its tone, all of which feature alnico III magnets and are custom wound to reproduce the sound of vintage specimens. The overall market opinion for the Squier Classic Vibe Stratocaster '50s (CV Strat '50s) is that it provides the best balance of quality and affordability. Reviewers commend its build quality, vintage style appearance and genuine sounding old school Fender tones. Even players who have played more expensive Fender Stratocasters found the shimmer and quack of the CV Strat '50s to be convincing enough to take on the road. And what's particularly interesting about the reviews is that people were not expecting too much from this Squier Strat, but were pleasantly surprised when it exceeded their expectations. As much as I would like this guitar to be perfect, there are users who raised concerns about the quality of the tuners, and minor finish issues. And while many did find the guitar tone to be convincing, there are some who found that upgrading the pickups made a very big difference to the sound. You're looking at the best Stratocaster in this price range, so this is the right guitar to start your hunt for your first or next Strat. Many decades after it was first introduced, the Les Paul is still as iconic as ever, available in a variety of versions (including clones) that cover everything from cheap to ridiculously expensive. The Goth Les Paul is an interesting entry in this list because there's nothing different about it on paper, other than its color, yet it still ranked higher than other Les Pauls in this price range. It comes with tried and tested wood combination of mahogany body and neck, alnico magnet humbuckers voiced to sound like old Les Pauls, and a straightforward tune-o-matic bridge. 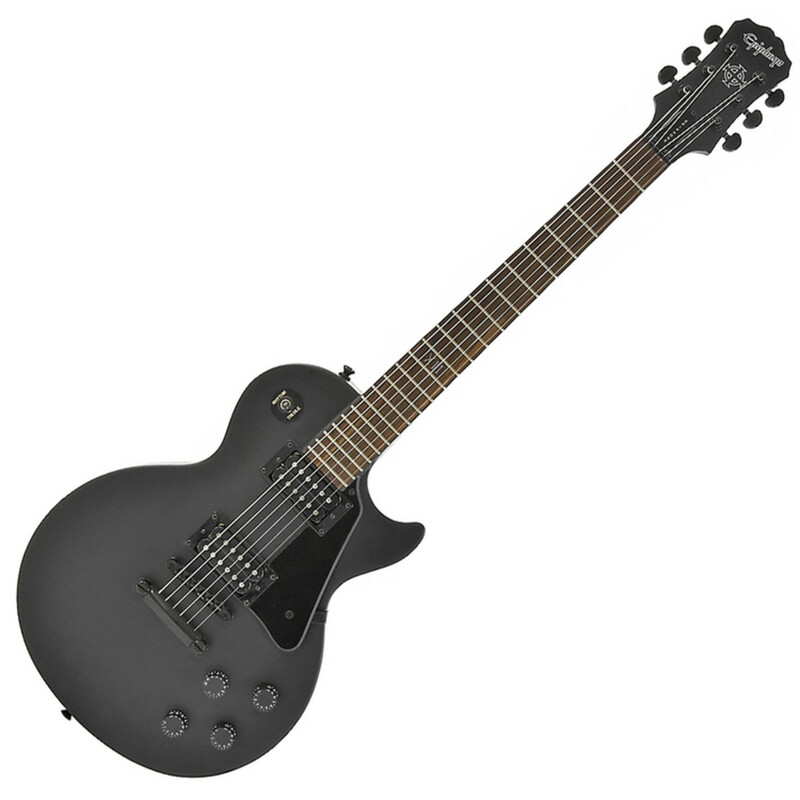 Most of the customer reviews are consistent in saying that this is an impressive rock guitar for the price. It appealed to guitarists who are into classic rock, while modern rock players who preferred a stop tail piece guitar also found the Goth Les Paul Studio to be an exemplary instrument. It goes without saying that the black color scheme of this guitar played a big role in its popularity, but its tone and playability also received thumbs up remarks. There aren't that many complaints about the guitar, other than a few who mentioned that some out-of-the-box adjustments were needed to get the guitar in optimal playing condition, most notably, the pickup height. The Epiphone Goth Les Paul is an easy pick for those who prefer a black guitar while keeping the classic look and playing feel of the Les Paul. 94 out of 100. Incorporating 1050+ ratings and reviews. 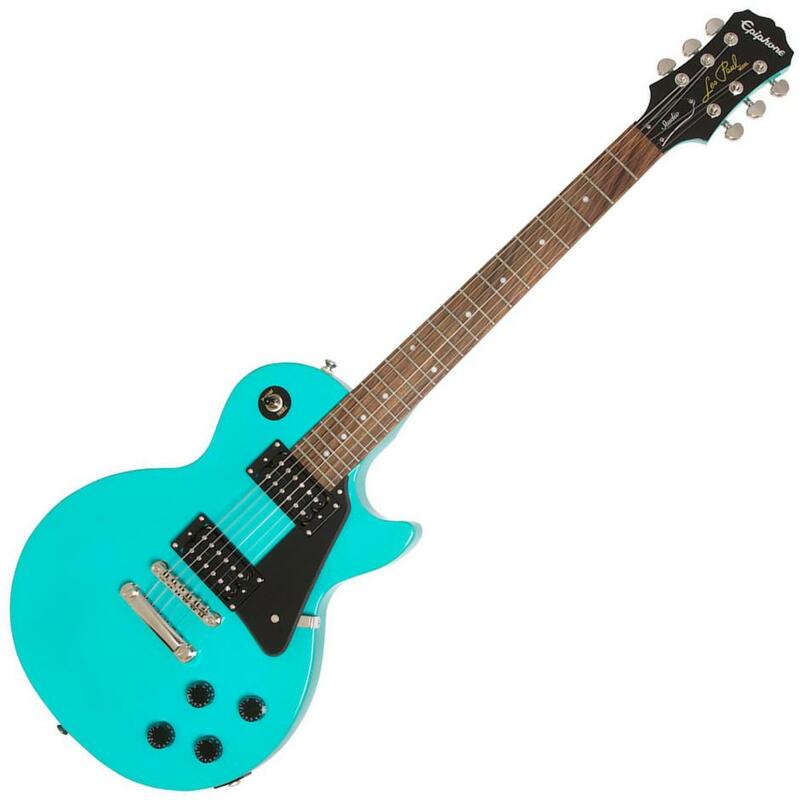 The Epiphone Les Paul Studio is a streamlined version of the Gibson Les Paul, used by greats like Slash, Jimmy Page, Zakk Wylde and many more - only this one is lighter and cheaper. Gone are the fancy bindings and metal pickup covers, but it retains essential Les Paul specifications, including its single-cutaway body, arched top design, and dual humbucker setup. For improved tuning accuracy and stability, this guitar comes with 18:1 ratio Grover machine heads. As of this writing, you can select between Ebony, Wine Red and Turquoise finish. Value for money gets the most commendation from both beginners and experienced guitarists alike. Second to it are positive remarks on its good overall build quality and aesthetics, which surpassed the expectations of many users. There are also plenty of users who are happy with how the guitar is setup right out of the box. There are some who recommend having the guitar's action adjusted by a professional for best results. There are also a few complaints about the default strings that it ships with, with reports of the guitar sounding much better after simply changing the strings. If you want to take the safe route, get a guitar with the classic Les Paul design. Ibanez continues to be the go to guitar for the likes of Steve Vai, Joe Satriani, George Benson and a long list of other virtuoso guitarists. But they're not just a brand for the elite - rather they are well known for their good balance of cost and quality - hence the popularity of guitars like the Ibanez S-521. To break free from the typical dual humbucker setup, Ibanez equipped the S-521 with a 5-way pickup selector that allows for more tone options. It's an interesting configuration which lets you select choose from the following - neck pickup, neck pickup (coils running in parallel), both pickups, neck pickup's lower coil and bridge pickup's upper coil, and bridge pickup. As expected, it comes with Ibanez' brand of low action playability via its wizard III neck profile. Finally, it comes with a fixed bridge for more sustain and tuning stability. Many are floored by how nice the guitar looks up close, so much so that it gets prominent mention. Having been made by Ibanez, playability is prominently mentioned, but surprisingly more users are impressed by its aesthetics. The availability of in between tones also gets thumbs up from players who are looking for more versatility from a dual humbucker guitar. No noteworthy complaints, other than the usual comments about the default strings being either too old or too thin. Note that if you're looking for one with a tremolo, this may not be for you. Overall, the Ibanez S-521 is a great buy for fans of Ibanez' smooth playability, or for those who are looking for a budget friendly rock guitar. 97 out of 100. Incorporating 60+ ratings and reviews. While Gretsch did not reinvent the wheel so to speak, they've definitely made their guitars their own - in terms aesthetics, quality and even sound. The G5220 is a good example, even with its familiar single-cutaway shape, it does not look like your average Les Paul clone. Its bound body, headstock and neck, along with its V-stop tail piece reinforce its distinct retro appeal further. This guitar has a chambered mahogany body with maple top, and comes equipped with Blacktop Broad'Tron pickups, which gives it the trebly tone that the brand is known for. Many users report that this guitar exceeds what they expect in terms of aesthetics appeal and build quality, some even describing it as a near perfect guitar. Many others are just as impressed with its tone, with some commending it for being transparent and dynamic. Rob Laing of Music Radar concludes his review of the Gretsch G5220 nicely by saying that "the sheer versatility and finish quality for the money makes this the kind of deal that you’ll always find space for in the house". There are some who wish that it had a more traditional control configuration, some even went as far as re-configuring the potentiometers to their liking. 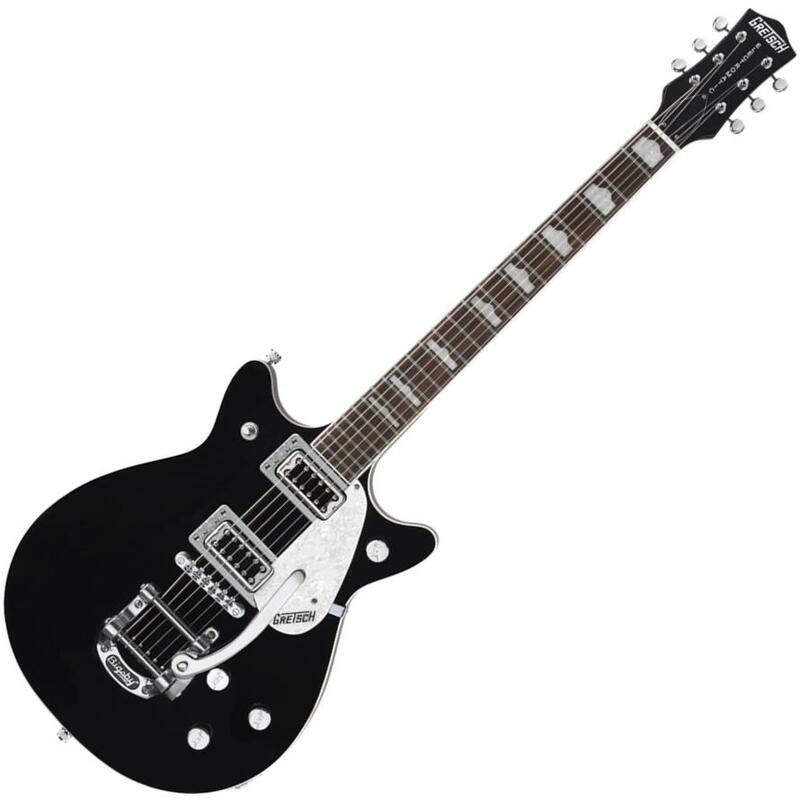 If you want a retro styled electric guitar that impresses both the ears and eyes, then check out the Gretsch G5220. Double Jet is Gretsch speak for double cutaway, so the G5445T is essentially a double cutaway version of their popular solidbody guitar design. And like its single jet sibling, Gretsch manages to make this design distinct, with some subtle but well placed changes to conventional double cutaway guitars. As the title suggests, this model comes equipped with a Bigsby tremolo bridge, which adds to its overall visual flair and allows for more note expression. Finally, it comes equipped with "Blacktop" Filter'Tron Pickups that give it a distinctly Gretsch sound. Overall market response to the G5445T is favorable, with many users initially taken in by its appeal. But it's not just about looking good, because there are many who are happy with the tones that they are able to coax with its controls. There are a few reports of action related issues out of the box, and there are some who felt that the Bigsby bridge system has room for improvement. With its stylish double cutaway profile and Bigsby tremolo, its hard to not like the Gretsch G5445T. 90 out of 100. Incorporating 80+ ratings and reviews. 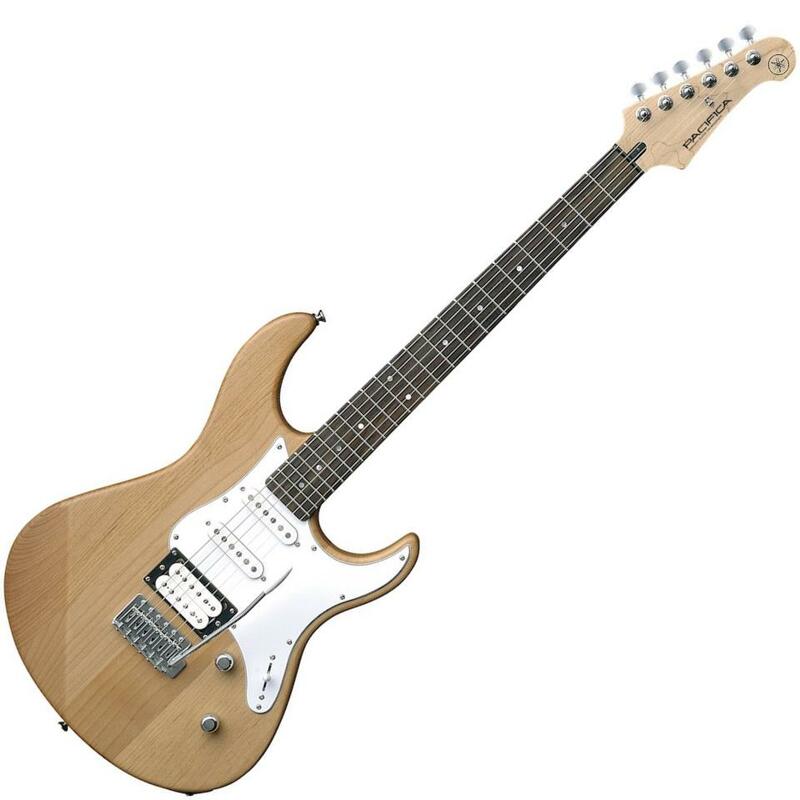 The PAC112V is part of Yamaha's Pacifica line of electric guitars, it is basically a modified Strat style guitar marketed for students of the instrument. At its core is its double cutaway alder body, with more room on the lower cutaway for reaching the highest notes. The neck is crafted from maple, and topped by a rosewood fingerboard, with a C-shape profile that's familiar and beginner friendly. Finally, it comes equipped with two singlecoil pickups for the neck and middle position, and a humbucker with coil splitting for the bridge position. Value for money is this guitar's main strength, many are surprised with its sonic flexibility, especially when considering the price tag. Playability and overall quality are also often pointed to by satisfied owners. More importantly, the Yamaha PAC112V gets a lot of complement from long time owners of the guitar, establishing its reliability and longevity, and further expanding the value that you're getting from the guitar. There are a few complaints about the strings it comes shipped with, along with the need for adjustments out of the box. If you're looking for a shred and rock style friendly beginner guitar, then do check out the Yamaha PAC112V. 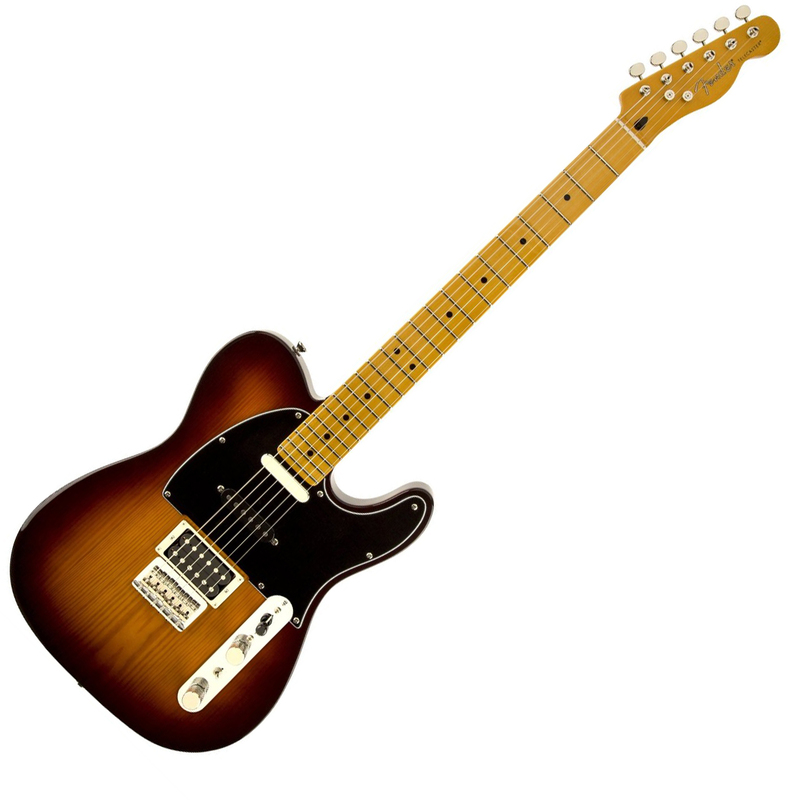 The Fender Modern Player Telecaster combines the singlecoil neck pickup of a Telecaster, with the singlecoil midde pickup a Stratocaster, and a humbucker pickup on the bridge. In addition, the bridge pickup is wired so you can split the coils, which means that you're not missing the single coil sound on the bridge position when you want it. All in alll, this guitar gives you more tone options, while keeping the classic appeal of the Tele. The guitar's body is crafted from lightweight pine, paired with traditional maple neck and fingerboard. It also sports a Stratocaster bridge with string-through-body tailpiece. Market sentiment points to this guitar being a fun instrument to play with, mostly due to its versatile pickup configuration, but also partly due to its good playability. There are reports of it working great in various styles, from country, to pop, to rock and more. The in-between pickup positions get a number of thumbs up for their tonal quality. There are some who encountered minor blemishes, while a few reported string action issues and fret buzz, the same issues that are associated even with expensive models. If versatility is high on your list, or you want a reasonably priced guitar that's fun to play with, then check out the Fender Modern Player Telecaster Plus. This is where we sometimes offer information about an item that didn't quite rate high enough to be recommended in any of the categories above, but for which there will be many people who would like to see our analysis of it. The Epiphone G-400 Pro SG is an interesting case where its ratings have actually improved slightly since we last updated this guide, but due to other guitars in its pickup configuration having achieved even higher ratings, it didn't have a place in the Humbucker section above. 91 out of 100. Incorporating 600+ ratings and reviews. The original SG may have failed to impress Les Paul, but it did impress scores of other guitarists, including greats like Tommy Iommi, Eric Clapton, Angus Young and many more. 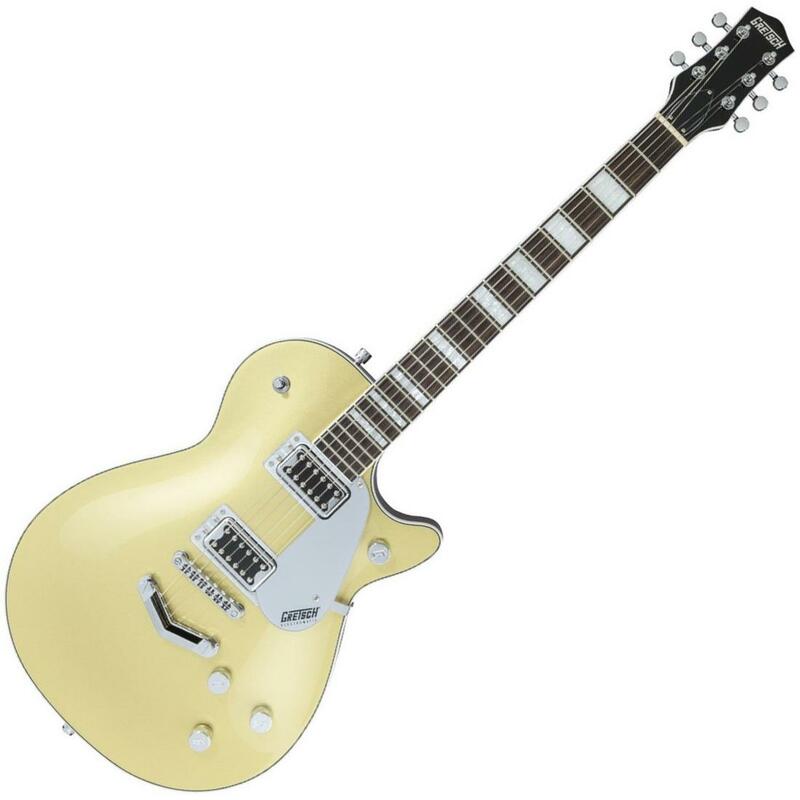 The Epiphone G-400 Pro is an affordable remake of the classic twin horn double cutaway shape guitar, albeit with modern enhancements meant to improve playability (via the SlimTaper D Profile), tuning accuracy and reliability (via the LockTone Tune-o-matic bridge) and expand its tone options (via its Coil Tapping enabled circuit). 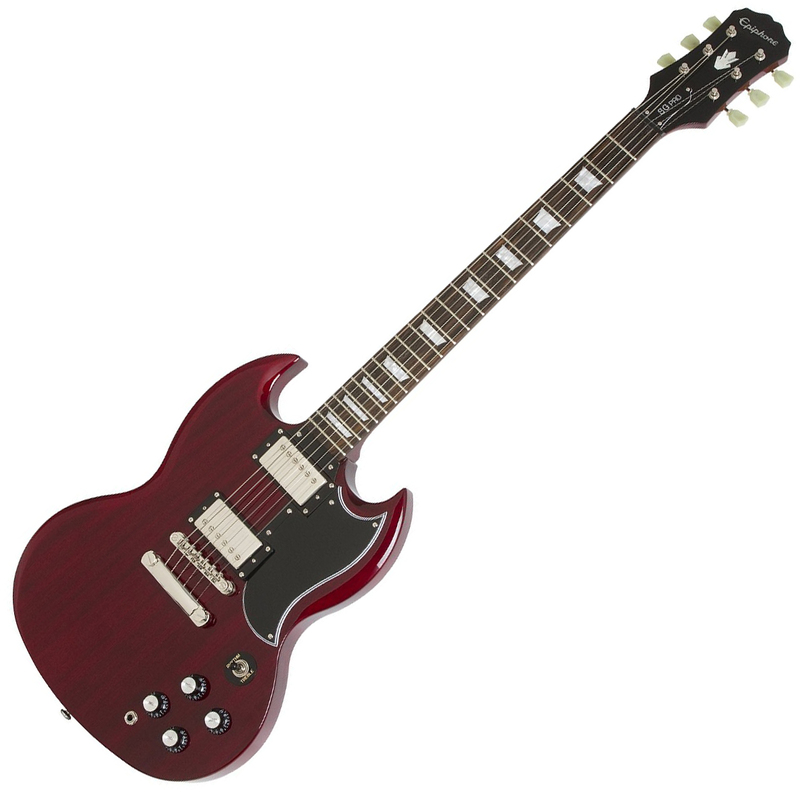 Many guitarists found this guitar to be a legitimate affordable alternative to the Gibson SG, so much so that some experienced players even compare it to vintage SGs, and do so favorably. The guitar's intonation and reliability were mentioned positively a number of times, along with its excellent build, considering its price. Another noteworthy feature that got mentioned quite a lot is its comfortable shape and weight, making it great for long practice and stage performances. Most of the concerns raised by users point to cosmetic finish related issues, however they are quick to point out that these issues are minimal and do not affect the way the guitar plays or looks. There were also a few who found issues with their tuning machines. If you're a fan of classic rock and the SG shape, the Epiphone G-400 Pro should be high on your priority list. The most common pickups you'll find on electric guitars are Humbucking (double coil) and Single Coil pickups. Single Coil pickups tend to emphasize the upper frequencies, while Humbuckers have a rounder tone with more of the low-end. In addition to their expected characteristics, the position of the pickups and the way they are combined also affect the resulting sound. FilterTron is another popular pickup type that is available in this price range, it is a staple pickup of Gretsch guitars and is a big part of their sound, which is described as a cross between a singlecoil and humbucker pickup. Shape and size-wise, filtertrons are similar to humbuckers, but they have different dimensions. There are a few more pickup variations, but we've left them out because they are not as popular in this price range. If you're not sure which one to get, you can look at the configuration used by your favorite guitarists. SSS - Guitars with three single coils, as seen on traditional Stratocasters. SS - Guitars with two single coils, as seen on Telecasters. HSS - Guitars with two single-coils and a humbucker on the bridge position, as seen on some modern Stratocasters and Super Strats. HSH - Guitars with two humbuckers for the bridge and neck position, and a single coil for the middle position, as seen on Super Strats and Custom Les Pauls. In addition to the above configurations, technology has made it possible for humbuckers to sound like single coil pickups via "coil tapping", allowing for flexible tone options that were not possible with older guitars. This is where the neck specifications come into play - which when neglected can result to unpleasant playing experience for both students and advanced players. We've listed the four most important specs to consider below, along with a quick overview of how they affect playability. Scale Length - the distance where-in the strings are stretched, from the nut to the bridge saddle. Physics dictate that the longer the scale length is, the more tension is required to get strings in tune. This is the reason why some players prefer the "slack" feel of a Les Paul with its 24.75" scale length, while others want the biting attack of the tighter strings on a 25.5" Scale Length Telecaster. Nut Width - dictates the space between strings at the nut, those with smaller hands will appreciate smaller nut widths (1.65"), while others who prefer more room for their fingers will want the opposite. Fingerboard Radius - without going too technical, this specification describes how flat or round the fingerboard is. Generally speaking, the flatter the radius, the lower the string action can be, which means easier single-note playing and bending. On the other hand, rounder fingerboards follow the natural shape of the fretting hand so are more chord friendly. Some players prefer the feel of vintage Fender guitars with 7.25" radius, while others want slightly flatter ones at 9.5". Those who are into shred and modern rock usually go for flatter radius that range from 12" to 16". Compound radius fingerboards try to give players the best of both worlds, by making the fingerboard flatter as you go up the neck, where you usually do your noodling. Neck Profile - describes the shape of the back of the neck. Together with the fingerboard radius and neck finish, it dictates the overall feel of the neck. Flat radius guitars are usually complemented by wide thin neck profiles, while rounder fingerboards come with U or C shape necks. Again, this is more a matter of preference than being right or wrong. This price range is where bridge setup options begin to expand, some guitars in this price range even come with a licensed Floyd Rose bridge that allow for tricks like note dives and pull ups. However, this added expression come with a few downsides, including unreliable tuning, inconvenient string changes, and longer learning curve for its operation and maintenance. You will ultimately decide whether to go for simplistic tune-o-matic bridge setups or the more complex floating bridge ones. The guitar's shape and finish can spell the difference between a boring and an inspiring instrument, so you'll want one that looks great and feels comfortable to you. Guitar players are drawn to the style of instruments that their heroes play, so they are your best starting point, but don't be afraid to look at other styles. Decades after they were first released, the Stratocaster, Telecaster, Les Paul and SG are still the most prominent solidbody guitar shapes. While there are other more eccentric shapes meant for rock and metal, most of what guitar builders produce today are either inspired by, or a direct clone of these guitars. In line with this, we covered a wide variety of popular guitar shapes, to help you find one that suits your taste. The goal of this list is to find the best solidbody electric guitars that you can readily buy in the $200 to $500 price range. So we set our scope to guitars that are widely available from major online US retailers. Note that we focused only on those with standard 6-string configuration, as they are the most commonly used. Even with these filters in place, we ended up having a not so short list of 25 popular and highly rated electric guitars, which entailed the analysis of over 9,600 reviews and ratings, including the most recent ones up to March of 2019. All these data were then fed into the Gearank algorithm, which resulted in scores that closely represent how actual owners, users and experts feel about the guitars. We used these scores to finally cut down the list to just the very best, divided into pickup type used - single coil, humbucker, filtertron and mixed. Finally, we drilled down on the pros and cons of each guitar as reported in customer and expert reviews to give you an overall idea of why these guitars are well loved. For more information about this process please read How Gearank Works. Submitted by Jason Horton on May. 23, 2018. Submitted by Jason Horton on Mar. 26, 2019.